NRCM’s Annual People’s Choice Award! Help us honor someone who has worked tirelessly to protect a special place, or has helped pass legislation safeguarding Maine’s environment, or has helped stop polluting companies from contaminating our state—someone who selflessly goes above and beyond to make sure future generations will enjoy the kind of Maine we know and love today. Learn about the six 2018 People's Choice Award finalists. Voting for this year's award is now closed. Winner will be announced at our 2018 Conservation Leadership Awards on Wednesday, October 17. 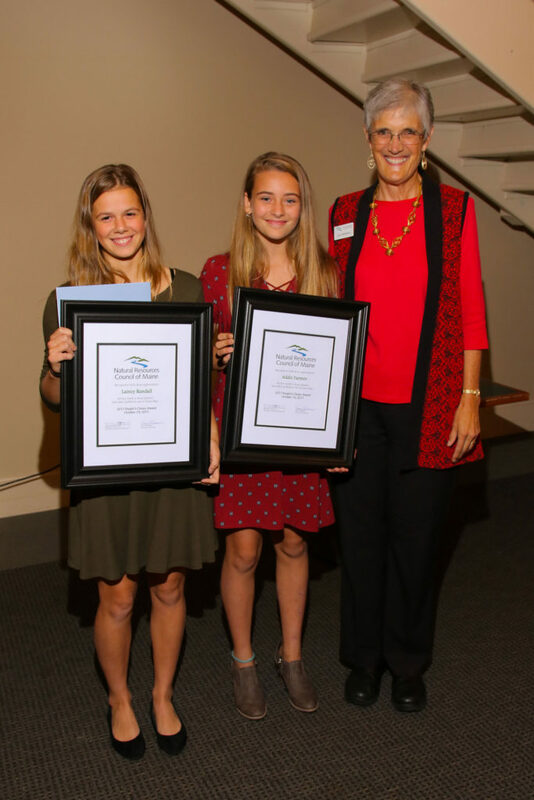 2017: Addie Farmer and Lainey Randall, of Portland, for their work keeping plastics and other pollution out of Casco Bay. Read a blog post, written by Lainey and Addie, about their work. 2016: The Larouche family, of Old Town, for the family’s commitment to wildlife protection and habitat conservation as well as environmental education for children and adults through the Hirundo Wildlife Refuge. 2015: Bonnie Pooley of Bethel, for her outstanding success in engaging young people in the work of protecting Maine’s environment. 2014: Robert Godfrey of Eastport, for his perseverance in protecting the beauty and heritage of Down East Maine by leading the grassroots organization, Save Passamaquoddy Bay. 2013: Thanks But No Tank of Searsport, for exceptional efforts mobilizing and engaging citizens to protect Searsport and surrounding coastal communities from potential harm posed by a proposed LPG tank and terminal. 2012: Bob Iles of Bethel, for exceptional efforts preserving the summit of and maintaining trails on Whitecap Mountain in Rumford, and for continued work to obtain public access to area lands and waterways as a member of the board of the Mahoosuc Land Trust. 2011: Belfast Co-housing and Ecovillage, for exceptional efforts and tireless work to establish a model environmentally sustainable, affordable, multi-generational cohousing community. 2010: Vera Francis of Perry, for serving as a leader in a true citizens’ movement in her efforts to protect Passamaquoddy Bay from a proposed LNG terminal. 2009: Evelyn Dunphy of West Bath, for her exceptional efforts in protecting Katahdin Lake from development. 2008: Willy Ritch of Woolwich, for exceptional leadership in mobilizing the citizens of Wiscasset to defeat plans for a coal gasification facility in their town. 2006: Eric Brown of Waterville, for starting Gang Green, an environmentally focused group of teachers and students at Lawrence High School. Note: Eric was the winner of our first annual People’s Choice Award.